Melt’s perfect blend of healthy oils features virgin coconut oil — a stable, healthful saturated fat and a rich, fruit-based source of medium chain fatty acids (MCFAs) — smoothly blended with flaxseed, hi-oleic sunflower, palm fruit and canola oils. As our flagship product, Rich & Creamy Melt® is the best tasting, organic alternative to butter or margarine. Rich & Creamy Melt cooks, bakes and melts just like butter, but with half the saturated fat and fewer calories. Each square of Melt is delicious and nutritious: certified organic and kosher, trans fat free, soy free, gluten free and made with non-GMO, eco-social and fair trade certified ingredients. Each serving of Melt is a rich source of the ‘good fats’ with an ideal balance of Omega-6 to Omega-3 ALAs (that are optimally metabolized with virgin coconut oil), and has 425 mg of Omega-3 ALA (or 26% RDA) and Vitamin E (or 15% RDA). Melt does include a small amount of grass-fed organic butter fat for natural flavoring, so it is not Vegan or Dairy Free (emphasis mine). I began easy, trying it out as a light spread alternative on my morning toast, spread over my waffles, in my gluten free blondies–all of which were quite delicious. Color me surprised. I’ve been hearing about the virtues of cooking with virgin coconut oil, but frankly, I find the taste of coconut oil by itself to be somewhat–funky. This mix with healthy coconut oil is quite nice. So then came the final test. Pastry. Because this product is supposed to behave just like butter in terms of cooking. And, in fact, it did (though if you’re using Melt for pastry, I should put it in the freezer for about half an hour to firm it up a bit first). Crumbles are kind of like upside down pie….a crumble topping is really just pastry dough you’re too lazy to make a crust with. Which, for someone like me who is terrified of making pie crust, makes them PERFECT. This recipe used frozen peaches and blueberries, but fresh would be marvelous. It just happened to be what I had on hand. Servings: 4 at 376 calories and 10 grams of fat. 2. Place the peaches and blueberries in a large bowl with the lemon juice, splenda, and corn starch. 4. Allow the mixture to sit for 5 minutes while you work on the topping. 5. For the topping, combine the flour, sugars, salt, and butter in a food processor or use a pastry cutter until the mixture is the size of big crumbles. 6. 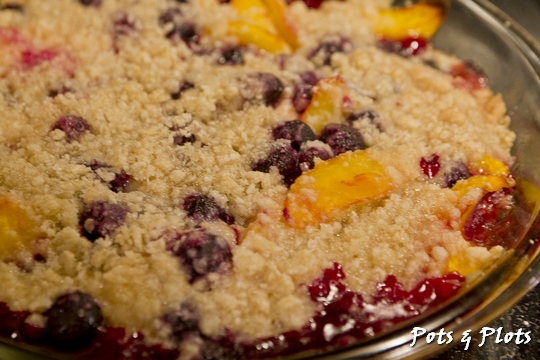 Pour into a pie dish, then sprinkle the crumble mixture evenly over the fruit. 7. Bake for 40 to 45 minutes, until the top is browned and crisp and the juices are bubbly. Crumbles are kind of like upside down pie....a crumble topping is really just pastry dough you're too lazy to make a crust with. Which, for someone like me who is terrified of making pie crust, makes them PERFECT. This recipe used frozen peaches and blueberries, but fresh would be marvelous. It just happened to be what I had on hand. Servings: 4 at 376 calories and 10 grams of fat. Place the peaches and blueberries in a large bowl with the lemon juice, splenda, and corn starch. Allow the mixture to sit for 5 minutes while you work on the topping. For the topping, combine the flour, sugars, salt, and butter in a food processor or use a pastry cutter until the mixture is the size of big crumbles. Pour into a pie dish, then sprinkle the crumble mixture evenly over the fruit. Bake for 40 to 45 minutes, until the top is browned and crisp and the juices are bubbly.